Potash is a mineral mainly used as an ingredient in the production of potassium fertilizers. As one of the three major plant and crop nutrients, potassium increases crop quality and protects plants against diseases and insects. With the world's growing population, demand for potash continues to rise following higher demand for agricultural produce. Canada is the world's major potash exporter, while Asian countries are the world's main importers, with Thailand ranked 5th in Asia. The development of potash mining in Thailand could curb imports and thus reduce production costs for the agricultural and manufacturing industries. Thailand's high potential in potash mining stems from abundant high-quality potash deposits and strong agricultural and food industries. However, environmental and social impacts resulting from potash mining must be kept in mind. To ensure the sustainable development of the potash mining industry, the public should be well informed about the costs and benefits. Expert consultation and a choice of optimal technology will minimize any negative impacts from potash mining. Potash is a family of industrial ores with high potassium content. It is commonly found with rock salt and used as the primary ingredient in the production of fertilizers. More than 90% of potash produced globally is used as raw material for potassium fertilizers. Potassium is one of the three main ingredients, along with nitrogen and phosphorus, used in the production of chemical fertilizers. Potassium fertilizers help increase production yields and protect plants against disease. Though not as prevalent, potash is also used as a raw material for some chemical products such as glass, soap, and ceramics. Due to potash's high salt content, a salt extraction process is required before potash can be used in fertilizer production. The salt extracted from potash can be used for cooking and road de-icing. Canada is currently the largest potash exporter, while Asia is the main importer. At present, the production capacity of Canada, the number one producer, accounts for 30% of total world production. Russia and Belarus are the second and third largest producers. Moreover, Canada has a potash export value of 40%, the world's largest. The main export destinations of Canada are the U.S. and Asia, whose potash imports account for more than 50% and 30% of Canada's total potash exports, respectively. Asia is without a doubt the largest import market for potash; Asia's potash imports account for more than 40% of the world's total potash exports. Thailand is the 5th largest importer within Asia. The high demand for potash in Asia is rooted in a significant percentage of the workforce employed in the agricultural sector as well as the region's strong population growth. Despite the large and growing demand, China is the only large potash producer, even though many Asian countries such as Vietnam, Laos, and Thailand are themselves endowed with ample potash resources. Currently, China has a production capacity of 4.4 million tons, but the country is able to export only around 0.1 million tons, relatively small compared to Asia's potash demand of approximately 15 million tons. What about the potash mining industry in Thailand? Thailand currently imports potash to produce fertilizers. While Thailand has abundant potash deposits, these resources have remained untapped due to strong public resistance.Thailand currently imports 0.7 million tons of potash every year for the production of potassium fertilizers, valued at around 10 billion baht. Imports are mainly from Canada, Belarus, and Germany. Additionally, Thailand also imports 5 million tons of chemical fertilizers that contain nitrogen and phosphorus in addition to potassium. The reliance on imports for both potash and chemical fertilizers has increased production costs in the agricultural sector. Developing a potash mining industry could help reduce the import burden. In fact, the 400 billion tons of potash deposits in Thailand are among the world's largest. Potash deposits are usually found in the Northeast provinces such as Chaiyaphum, Udon Thani, Khon Kaen, Sakon Nakhon, and Nakhon Ratchasima. Moreover, these deposits are of high quality. For instance, the sylvite potash commonly found in Udon Thani is one of the best types for manufacturing potassium fertilizers. In addition, potash in Thailand can be found only 150-300 meters under the ground surface, making the mining cost much lower than many places in the world where potash mines are more than 1,000 meters underground. Despite its high potential, potash mining in Thailand is largely halted by strong public resistance. The negative environmental and social impacts of mining are the main reason for strong resistance to potash mining sites near residential areas and communities. Impacts on the environment are the key issues demanding the attention and concern of all parties. The salt extracting processes in producing potassium fertilizers pose risks of increasing water and soil salinity as potash deposits with potential economic benefits are located close to water sources and residential communities. This would largely affect households relying on natural water sources and agricultural land for daily activities. On top of that, underground potash extraction may cause land subsidence. There are also other health and social effects from potash mining. For example, direct contact with potash in large quantities may lead to skin irritation and bowel problems. The lifestyles of households in mining areas will change as community transforms from an agricultural society toward an industrial society. Additionally, natural water sources will have to be split between agricultural and mining purposes, as the potash-mining process requires large amounts of water. That said, the development of a potash mining industry in Thailand could add economic and business benefits. The current import price of potash is around USD300 per ton, while the average cost of mining potash is around USD100-200 per ton. Though import prices are down from the pre-financial crisis level of USD900 per ton during 2008-2009, the price of potash is expected to rise in the long run. This increasing trend is due to rapidly growing global demand for agricultural products, rising populations, and the development of green economies. With its own potash mining, Thailand can expect to lower the cost of agricultural production and create spillover benefits for related industries. For instance, the fertilizer industry will benefit from a lower cost of raw materials to make cheaper potassium fertilizers and become a competitive and stable production center. The chemical products industry should benefit from the supply of potassium chloride and the salt extracted in potash mining for use in the production of soap, bleach, and ceramics. Moreover, the bio-fuel alternative energy industry can be developed more sustainably as the supply chain in the agricultural sector will be more integrated when Thailand is self-reliant on potash. At the macro-economic level, potash mining in Thailand will reduce potash imports, which currently stand at around 10 billion baht. It will also attract trillions of both domestic and foreign investment to make use of Thailand's available potash deposits. In addition, there is a potential for exports of potash ores and chemical fertilizers should production become sufficiently large. Potash mining should also lead to more employment and higher incomes in local areas. The collaboration of the public, private, and civil society sectors in supporting, educating, and finding preventive measures as well as optimal technology to minimize the impact of potash mining will encourage the sustainable development of potash mining in Thailand. To ensure the sustainable development of domestic potash-mining businesses as a viable substitute for imports, the government should provide the public with detailed information on the costs and benefits of potash mining. The government should encourage the private sector to take on the obligation of managing environmental impacts on local populations and communities. The case of the potash mining industry in Canada can provide a good example. The province of Saskatchewan, albeit being the world's largest potash producer, has minimal pollution levels. This is a result of 10-step environmental impact assessment procedures that include the participation of the community in setting up rules on environmental impacts and technological evaluations of potash extraction technology. In the future, chemical fertilizers will become ever more important for Thailand's agricultural industry in meeting the growing demand for agricultural products and processed agricultural products. A domestic potash supply for chemical fertilizer production will therefore boost Thailand's competitiveness. Potassium provides nutrients required to improve the quality of agricultural products and protect crops against diseases and insects. It is therefore necessary in the production of chemical fertilizers to be utilized along with organic fertilizers commonly used in the Thai agricultural sector. This will help increase crop yields to meet rapidly growing consumption due to the world's population growth. In addition, the lower costs of chemical fertilizers and the high potential of potash mining in Thailand should continue to lower prices of agricultural raw materials and costs incurred on the industrial sector. More importantly, Thailand's own potash mining development will unleash the country's potential through a better-integrated agricultural supply chain, which comprises an abundant upstream potash supply, a midstream chemical fertilizer industry, and downstream agricultural products with strong domestic and export demand. But in order to ensure sustainable potash mining development, the industry needs to take seriously its responsibility for providing recovery and preventive measures to safeguard any potential environmental and social impacts. 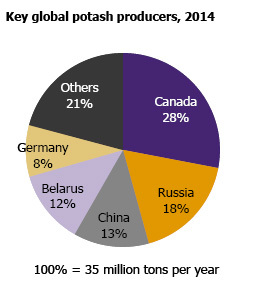 Figure 1 : As the world's largest potash producer, Canada provides 30% of global potash output. 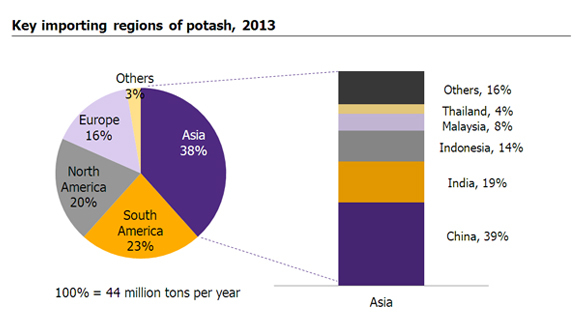 Figure 2: Asia is the world's largest potash importer, with Thailand ranked fifth in the region.